was established in 1997 by Burnell Weaver and Lincoln Graybill as a full service aggregate provider for the Michiana area, located in the western part of Elkhart County, Indiana offering sand, gravel, topsoil, limestone and recycled concrete/asphalt. We are an Indiana Certified Aggregate Producer for #23 sand, #4 structural backfill, and snow/ice abrasive. Currently we are accepting broken concrete and asphalt at our pit at no charge (minus excess dirt, wood, and trash). Deliveries are prompt, generally within 1 business day. 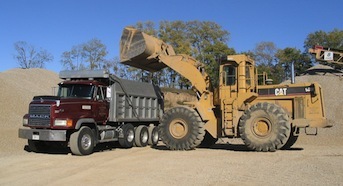 We also can provide tri/quad axle dump truck rental. For a quote on delivery and material don&apos;t hesitate to call. Yellow Creek Gravel Services is a proud member of the Builders Association of Elkhart County and the Indiana Minerals Aggregates Association.